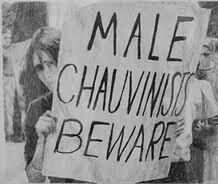 If you are a man and I call you a Male Chauvinist Pig, what will you understand of it? Would you, in the first place, get an idea of it? He lacks chivalry: He might have got together a few acts to impress you - he held the door for you while entering a restaurant. But what counts is if he will hold it while you exit. He gives False Hopes: Knowingly he might give someone false hopes and wrong signals. And then suddenly tell you that I am confused! He crosses the limits you set: If you have been setting limits, and he intrudes that space, then it is taken that he is a loser. A real man will allow a woman to go by her heart, and there can never be a case when one does not know one's limits - not just in action but also while talking. Show-off runs in his blood: He has all the stuff to show off to the world, and ultimately would want to make you into a Barbie doll and flaunt you around. The day you gain weight, he will leave you! Will be your appointed critic: He will tell you that you are wrong, either out-rightly or drop mild clues, almost for every action of your. He would criticize and say that since you are close he needs to tell you. He will decide how many breaths you should take in an hour! If you have noticed these clues in your boy, get your mind together girl, he can be a total mamma's boy. It is not that being a mamma's boy is wrong, but he will from the very start work towards building a fear in you about his mommy, just to indicate that you have to please her and be her slave. His mommy might not be bad. For every argument that you will have with him, he might leave you in a state of big dilemma, totally making you feel sorry and get back to him. Rethink about it, do you really want to be with someone who wants to change you, who does not give you space to grow as an individual, but as an abla naari, who just cannot do without a man next to her. P.S. : My friendly, unfriendly, no-more-friendly and Blocked being friendly encounters have taught me this. Although most of the times I get along well with guys, but the Chauvinists just pester me off, they are the Male Janaanis (Punjabi word for over-analytical women). Author's Note: An abusive alcoholic man is better than an educated man with such a mental structure, for the reasons that he is honest with his mentality and expresses it bluntly. An abusive alcoholic man can still be treated with psychological intervention, but hopes for a Male Chauvinist Pig are too bleak.